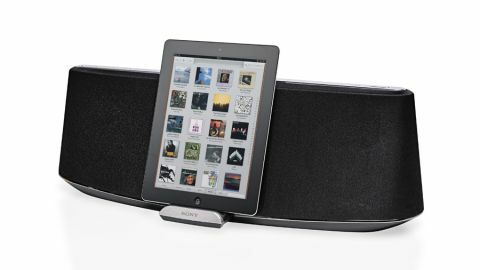 Sony has a hit on its hands with the XA900 iOS speaker dock. It might cost £370, but what you get for that money is a brilliant-sounding iOS dock that ticks pretty much every connectivity box you could ever need. Plenty of systems offer Bluetooth or AirPlay wireless tech. The XA900iP incorporates both, while also offering a standard iOS dock plus 3.5mm and optical-in ports. Setting up AirPlay is done via an app, which you are prompted to install. It's straightforward and connects with your iTunes library or iOS device without a hitch. For the money, we'd expect something that sounds sublime, and that's exactly what you get. The soundscape is punchy and crisp across the board, with wholesome mid-range sandwiched between a pin-sharp high-end and creamy bass. It sounds so good that you can really tell when you've switched to one of the wireless connection options, where it loses some of its vibrancy. The asking price is a little high, though it's around £180 cheaper than the Zeppelin Air. Perhaps it doesn't sound quite as dazzling, but the addition of Bluetooth, optical-in and a much cheaper price put it in a strong position to nab that cash you've been saving for a rainy day.